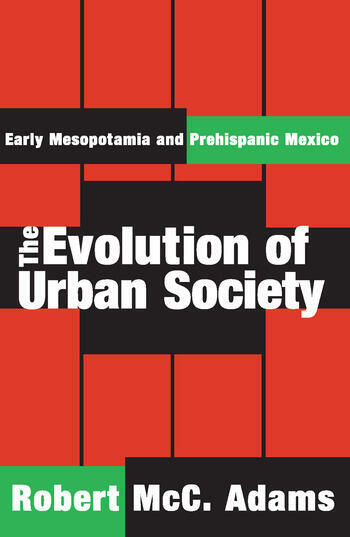 The Evolution of Urban Societyis concerned with the presentation and analysis of regularities in the two best-documented examples of early, independent urban society: Mesopotamia and central Mexico. It provides a systematic comparison of institutional forms and trends of growth that are to be found in both of them. Emphasizing basic similarities in structure rather than the many acknowledged formal features by which each culture is rendered distinguishable from all others, it demonstrates that both societies can usefully be regarded as variants of a single process.Generalizing, comparative analyses of the origins of ancient civilizations in early anthropological studies emphasized the diversity of their cultures rather than their similarities. As this volume illustrates, early societies, in actuality, provide a significant example of broad regularities in human behavior. The emergence of states - of stratified, politically organized societies based upon a complex division of labor - is one of those great transformations that have punctuated human civilization. Adams shows why the study of societal evolution is so significant, and why it has remained a durable and attractive anthropological focus of interest.Originally published in 1966, The Evolution of Urban Society is based on a series of lectures at the University of Rochester in honor of the esteemed anthropologist Lewis Henry Morgan. It remains required reading for students of anthropology, ethnography, ancient civilizations, and world history. As Elizabeth Carter noted in Science at the time: "Adams's The Evolution of Urban Society set the agenda for contemporary research into early urbanism in the [Mesopotamian] region."